Raging Tempest is a Booster Pack in the Yu-Gi-Oh! Official Card Game (OCG) and Yu-Gi-Oh! Trading Card Game (TCG). It is the eleventh set in the OCG's 9th series, following Invasion: Vengeance, and followed by Maximum Crisis. Includes cards used by Yuya Sakaki, Gong Strong, Yugo, Dennis McField, Obelisk Force, Kite Tenjo, Alexis Rhodes, Rin, Celina, Lulu Obsidian, Jean-Michel Roger, Allen Kozuki, and Chojiro Tokumatsu. Includes members/support for the "Ancient Gear", "Black Luster Soldier", "Cipher", "Crystron", "Cyber Angel", "Flower Cardian", "Gaia The Fierce Knight", "Galaxy-Eyes", "Infernoid", "Magician", "Odd-Eyes", "Performapal", "Rank-Up-Magic", "Ritual Beast", "Shaddoll", "Shiranui", "Superheavy Samurai", "Super Quant", and "Void" archetypes, as well as the "Cyber Girl", "Railway", "Wight", and "Virus" series. 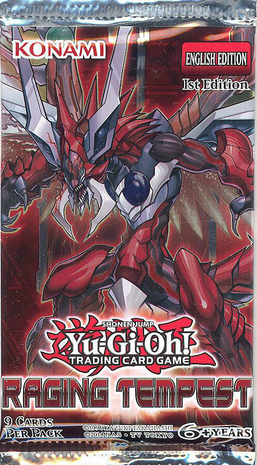 The TCG version includes members of the "Dark Contract", "Fusion", "Lightsworn", "Magnet Warrior", "SPYRAL", and "Subterror" archetypes. Introduces the "Windwitch" and "Zoodiac" archetypes, as well as the "Shinobird" series, to the OCG/TCG. Introduces the first support for the "Pendulum Dragon" archetype. ↑ "The Organization | [OCG] Raging Tempest". YGOrganization. June 20, 2016. This page was last edited on 7 January 2019, at 00:29.